Nooteboom trailers are available with various makes of sliding canopy systems. The latest development here is the Netcap sliding system. 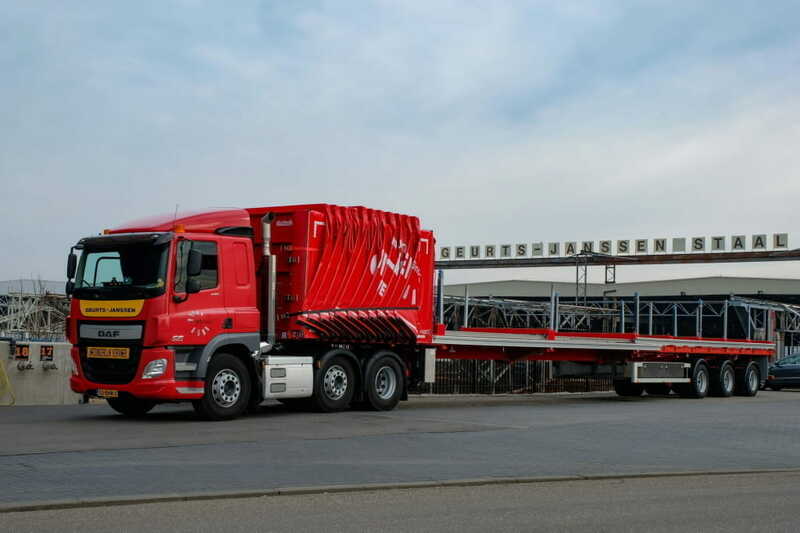 In cooperation with Netcap International and Van Rijssel Carrosserie, Nooteboom has developed a special extendible trailer with a canopy for steel supplier Geurts-Janssen from Venlo. Canopy constructions for extendible trailers were already available, but it meant the driver had to fit separate parts to guide the canopy. Those days are over, because the Nooteboom 3-axle extendible Teletrailer of Geurts-Janssen is equipped with a specially designed double rail system. Whether the trailer is retracted or fully extended: with this system the canopy can be operated by one single person. The trailer has a special width to keep it within the legal dimensions. Geurts-Janssen celebrated their 150st anniversary in 2017. Over the years the company developed from a local trading company to a leading international wholesaler in structural steel, reinforcement steel, non-ferrous materials and other technical products. The company is led by the fifth generation of the family of the founder, Bernard Geurts. 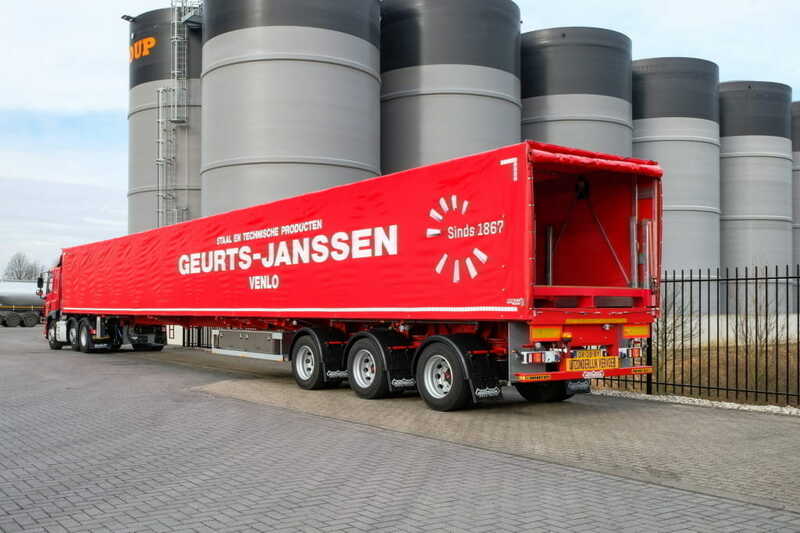 Geurts-Janssen also supplies processed products. On their premises of 36,000 m2 at the Tjalkkade in Venlo the company can also provide sawing, blasting, shearing, bending and other processes. Thanks to their own port and six steel production halls with a vertical span of 33 metres, Geurts-Janssen can deliver ultra-long steel sections from stock. They run their own transport vehicles, driven by extremely experienced drivers. Netcap International delivers a sliding system for trailers. The construction is extremely stable and the canopy smoothly slides open and closed. A Netcap sliding canopy is designed to cover the load floor of the trailer quickly and easily to protect the load from the weather. Dangerous scrambling adventures over the load are a thing of the past, because the driver can pull the canopy over the load with one hand while he walks along the trailer. Apart from protecting the load from the weather, the sliding canopy also significantly reduces the time taken to load/unload. The Netcap system is based on a special aluminium rail section with recesses for the vertical and horizontal wheels. The rail is reinforced at the top so that no damage is done if a forklift truck knocks against the rail. The special Netcap sliding canopy is a success internationally too, since Netcap delivered a special, 5.5 metre version for the transport of Airbus wing sections. 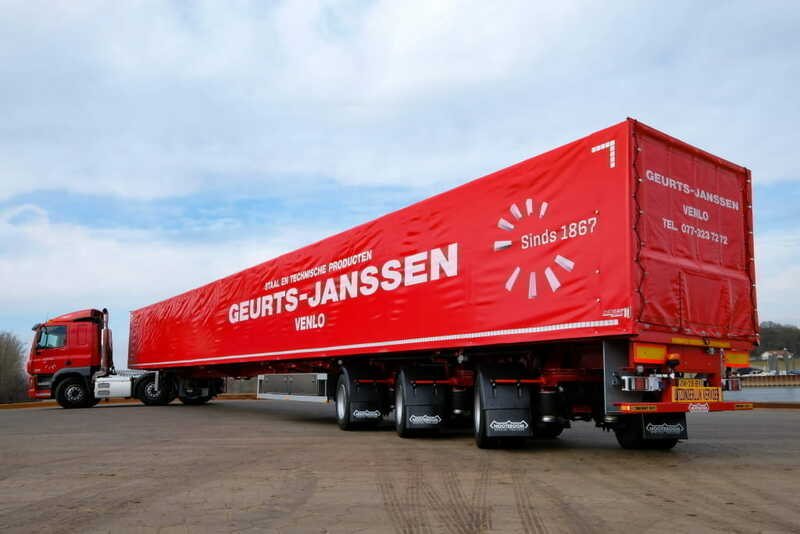 The new Nooteboom Teletrailer of Geurts-Janssen was developed in close cooperation with all four parties concerned. While it was being built the technical details were discussed regularly. The basis is the Nooteboom Teletrailer, which has proved many times over to be an efficient vehicle to transport long steel sections and steel structures. Netcap is a specialist in sliding canopy systems with a worldwide customer base and Van Rijssel Carrosserie put it all together. And thanks to this collaboration the drivers of Geurts-Janssen are now able to keep their – blasted – steel clean and dry during transport.